Another pinterest activity I'm afraid and another spidery one for our last activity in our garden and nature theme month. 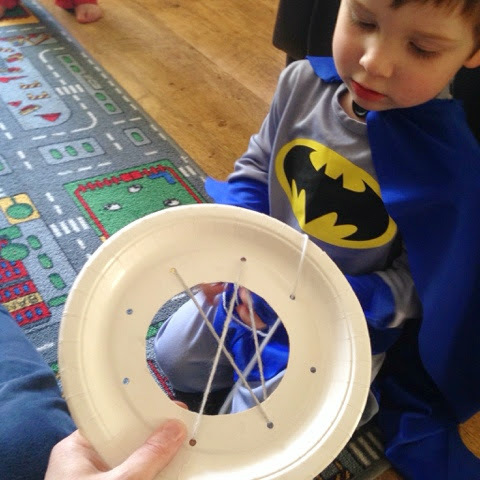 If you've been following our posts, you'll know that we had our newphew J (nearly 4) last weekend, after our sticky spider web activity the boys really needed something nice and quiet to do to calm down! 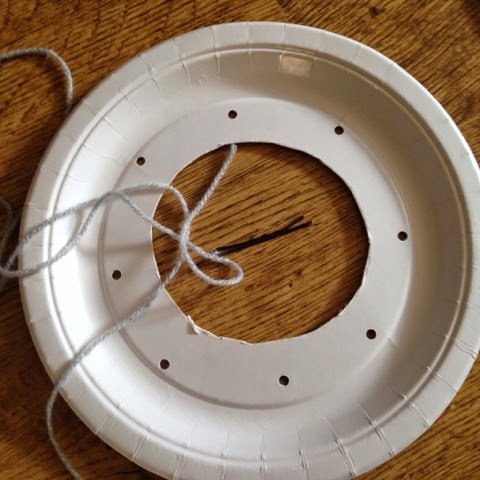 Anyway, I didn't fold my plate in half, I just cut a circle out of the middle and I attached a hairpin on the end of the wool to make it easier to thread for the boys, something I've done before on a sewing/threading activity with T.
For T I held the plate for him while he threaded the wool through the holes, at 2 1/2 he just needed that extra bit of help. I hope that you are not getting arachnophobia from all our spider fun! Our spider sandwich lunch can be found here and our sticky spider web activity can be seen here if you'd like a complete day of spidery giggles!